Even children are drawn, viscerally, to "The Figure 5 in Gold," one of the most recognizable works in American Modernism. Painted in 1928, its vibrant red, black and gold fire-engine motif barrels at the viewer, delivering a "Pow!" that Pop artists strived to achieve a few decades later. Somehow, the bold image manages to transmit not only the speed but also the screams of a fire truck weaving its way through a crowded New York street. On its own, this visual impact might have made Charles Demuth's most famous work into an icon of American art. But "The Figure 5 in Gold" has much more going for it. It's the best work in a genre Demuth created, the "poster portrait." It's a witty homage to his close friend, the poet William Carlos Williams, and a transliteration into paint of his poem, "The Great Figure." It's a decidedly American work made at a time when U.S. artists were just moving beyond European influences. It's a reference to the intertwined relationships among the arts in the 1920s, a moment of cross-pollination that led to American Modernism. And it anticipates Pop art. If that sounds like a lot to expect of a 35½-by-30-inch painting, which hangs in the Metropolitan Museum of Art, it also suggests that the versatile Demuth (1883-1935) remains underappreciated by the general public. Part of the stable of first-generation Modernist artists shown by Alfred Stieglitz, Demuth was known at first for his delicate, poetic watercolors, which many critics have deemed among the best in that medium by any American artist. These works, still lifes of flowers and fruit, as well as outdoor subjects like trees and rooftops, owe a debt to Cézanne. With Charles Sheeler, Demuth also founded Precisionism, those fastidious, flat, geometric portrayals of factories, grain elevators, towers and other facets of industrial America that also draw on Cubism. But Demuth never let go of reality: his abstracted images are totally recognizable. Ever imaginative, in the years between 1923 and 1929, Demuth painted a series of works he called "poster portraits." Instead of rendering the physical appearances of his friends, he deployed symbols, objects and typography to portray their professional lives. For his first, of Georgia O'Keeffe, he painted a large pot containing a green Snake Plant, whose long sharp leaves look like tongues, flanked by sensuous fruits. On the right, "O'Keeffe" is painted in red, bottom to top. Demuth went on to make a number of poster portraits, for the likes of Arthur Dove, actor Charles Duncan, and John Marin. By the time Demuth picked up his brushes for "The Figure 5 in Gold"—his last—he was at his most clever and most polished. "Others in the poster portrait series have as much meaning," says Robin Jaffee Frank, a senior associate curator at the Yale University Art Gallery, who organized an exhibition of the series in 1994, "but this one is certainly the most monumental. It is the best synthesis of shared ideas about the symbiosis between painting and poetry. It's the most visually powerful." In Williams's "The Great Figure," the poet describes how he watched a fire engine clanging through Manhattan on a rainy night. The viewer of "The Figure 5 in Gold" stands in the same position as Williams, who was viewing the scene while on a visit to the artist Marsden Hartley's 15th Street studio. Demuth structured his work around simplified forms—the red truck, the black highrises, the glowing white street lamps, and of course the brilliant gold 5s, three in full plus the curve of one, very close, in the upper right hand corner. Many texts assume the numbers are receding, as the truck moves away, but I always saw them as advancing. "It's both," says Ms. Frank—quite logically, as Williams may well have seen the truck both coming and going. Demuth crisscrossed these elements with diagonal lines that both provide light and give a sense of the rain. He played the sharp angles of the buildings off against the soft curves of the 5s and the globe lights. Interspersed among these elements, Demuth placed three typographical references to Williams. "Carlos"—his mother, of Spanish and French descent, was born in Puerto Rico—is tucked under the top of the largest 5 and rendered in the lights of a theater marquee, suggesting his stellar reputation. (The missing "S," behind a building, helps create depth in the painting.) At the bottom of the painting, in the center, are the poet's initials, "W.C.W." And on the top left, there is "Bill." 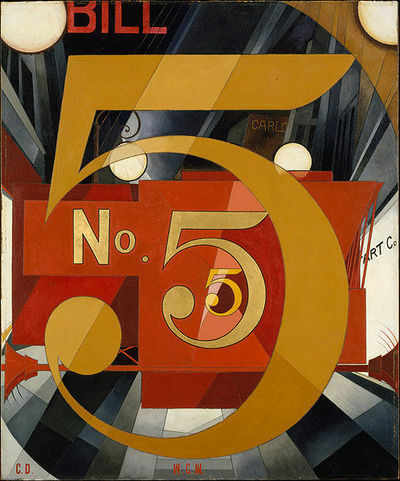 Demuth put his own initials, "C.D.," in the lower left. And on the right is "ART Co," which equals "art company." It's Demuth's pun on the avant-garde circles in which the artist and the poet—who hung around together in Greenwich Village and at the salons of Walter and Louise Arensberg and Mabel Dodge—traveled. What makes "Figure 5" distinctly American are the skyscrapers, the machinery, and the references to advertising, the very things America was known for at the time, when it was growing in commercial power. "Bill," in fact, is seen as a play on "billboards." Later artists, from at least Jasper Johns forward, would pick up on this use of commercial references. Overall, the painting conveys the sense of a dynamic narrative, of movement—fitting, as the central word of Williams's poem is "moving." It's this energy that distinguishes "The Figure 5" from, say, Hartley's "Portrait of a German Officer" from 1914, which also uses emblems and insignia to evoke a man, and works by Stuart Davis, which use typography and commercial images. "The Figure 5" was shown almost as soon as it was finished, at Stieglitz's Intimate Gallery in April 1929. Later that year, it went up on the walls of the Museum of Modern Art, in "Paintings by 19 Living Americans." The Met acquired the oil-on-cardboard painting in 1949, as part of a gift from Stieglitz; most of the other poster portraits went to Yale.